When you think of Georges Seurat, you probably picture his pointillist masterpieces like A Sunday Afternoon on La Grande Jatte, but in his tragically short life (he died during a diphtheria epidemic when he was just 31 years old), Seurat produced far more drawings than he did paintings. Along with La Grande Jatte, he made six other large-scale paintings, 60 smaller paintings and oil sketches, some of the latter preparatory to the monumental pieces. There are about 500 surviving drawings, plus four sketchbooks from late teens and early 20s when he was in art school and just after he left. (You can see selections from those notebooks in this online exhibit MoMA created to accompany their 2007 show of Seurat’s drawings.) 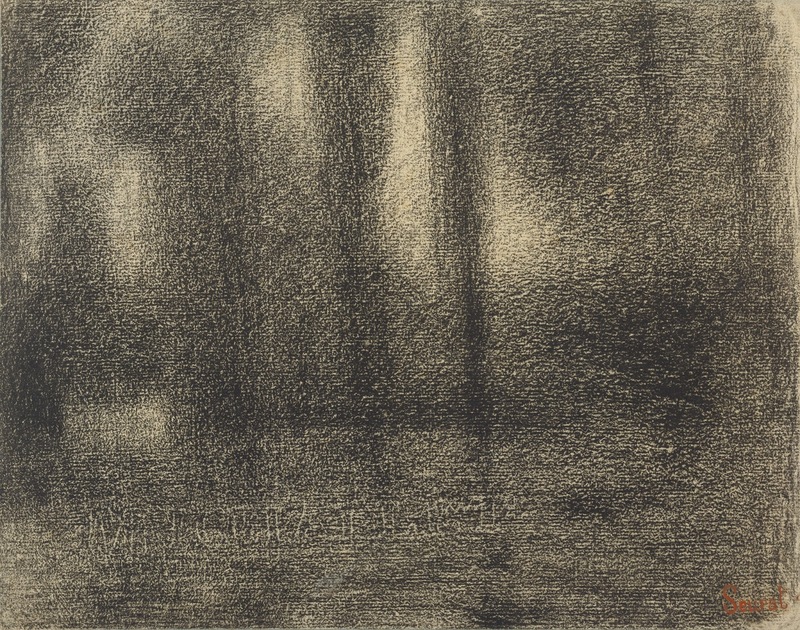 Stripped of the intense color and brushwork of his Pointillist pieces, Seurat’s drawings showcase his development as an artist, his understanding of light and dark, his use of lines, cross-hatching, paper and pencil textures to create images that can be both realistic and sometimes verging on abstract. Georges Seurat was born to well-off parents in Paris in 1859. He began drawing at an early age; his first extant drawings were signed and dated 1874, when he was 14 years old. Recognizing his talent but unwilling to let him bypass a conventional education, in 1875 his parents sent him to the Ecole Municipale de Sculpture et Dessin, a small neighborhood art school run by sculptor Justin Lequien, while he finished high school. There the focus was on copying the classics, drawing from lithographs of old masters and plaster casts of ancient sculptures. He was entirely competent at it, but there was little sign in these highly formal early forays of the innovator Seurat would soon become. His secondary schooling completed, in 1878 he passed the entrance exam of the Ecole des Beaux-Arts and continued his instruction under Henri Lehman. 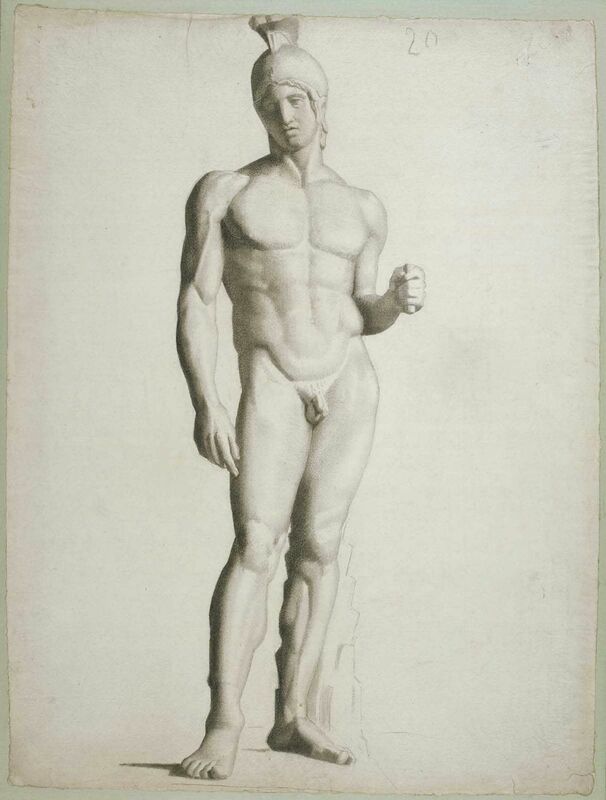 Lehman’s pedagogical approach was similar to Lequien’s, focused on drawing live models, after antique sculptures, old masters and French Baroque and Neoclassical works. Drawings survive from Seurat’s school days that are copies after Raphael, Michelangelo, Titian, Ghiberti, Perugino, Holbein, Poussin and Ingres, among others. He seemed poised to follow the well-worn path towards conventional success in the French art world of the late 19th century: pass exams, exhibit, win prizes, go to Rome to study the classics in person, return to snag commissions from the government and wealthy patrons. Then he took a detour. Eighteen months in to his studies at the Ecole, he left to do a year of military service. In November of 1880, he was released but he didn’t go back to school. His formal education was over. Seurat rented a little studio apartment, drew informal sketches of the people and landscapes of Paris and environs, spending two years concentrating on black and white drawing. That’s not to say he rejected his schooling. He may have chafed under it and rebelled, but you can see the student of ancient sculpture in the still postures of La Grande Jatte, and the Renaissance copyist in his embrace of light and dark. He would later describe this period to Belgian symbolist poet Emile Verhaeren: “Little by little he told me about his beginnings, his apprenticeship with Lehmann, his school years, the whole story of efforts soured by routine and outmoded practices. Then how he found himself, personally, through studying others, through lessons and rules, the way one discovers unknown stones beneath stratifications of land and soil.” That voyage of self-discovery, of integrating his schooling with his own vision and study of color theory, is key to our understanding of the Post-Impressionist pioneer he grew into. One of the earliest drawings to show Seurat’s movement away from idealized antique forms into his own personal style is Mendiant Hindou (Indian Beggar), drawn ca. 1878, either the end of his studies at the Ecole Municipale de Sculpture et Dessin or the beginning of his time at the Ecole des Beaux-Arts. It sold at a Sotheby’s auction on Thursday for $3,971,644 including buyer’s premium, far, far exceeding the pre-sale estimate of $130,512 – $195,768. Instead of disappearing into an anonymous private collection, this important transitional piece has found a new home in that most deep-pocketed of museums, the J. Paul Getty Museum in Los Angeles. 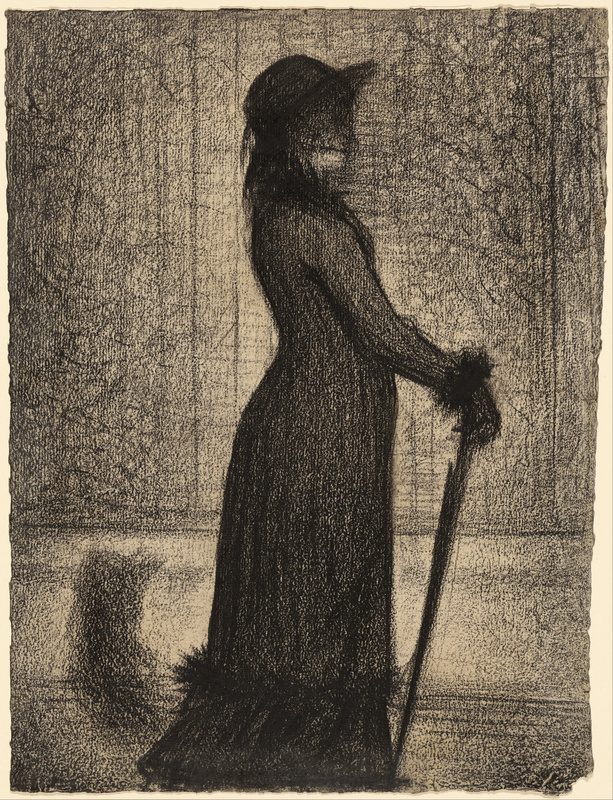 The Getty has no Seurat paintings, but it does have three other significant drawings the artist made in the early 1880s. 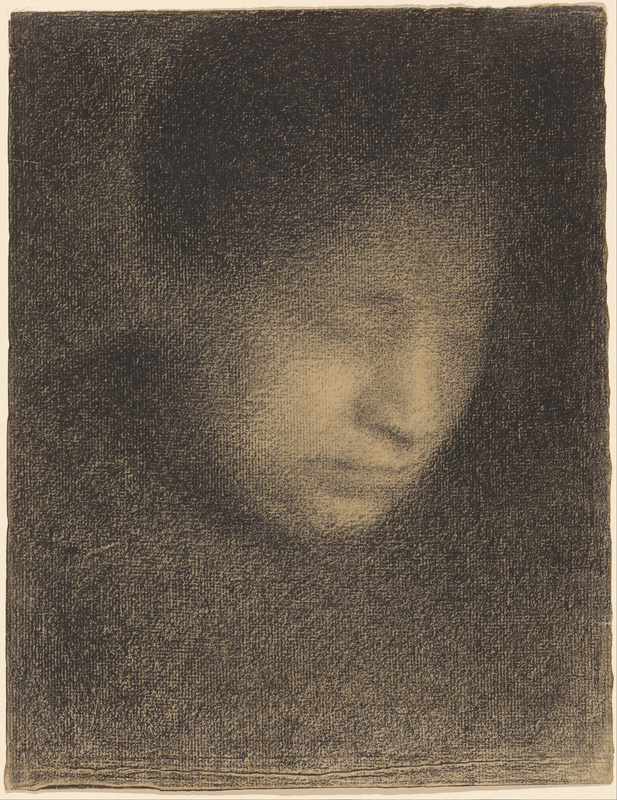 Indian Beggar represents a critical turning point in Seurat’s approach to figure drawing, towards a more distinctive style that employs gradations of light and shadow to define the form and mood of his subjects. 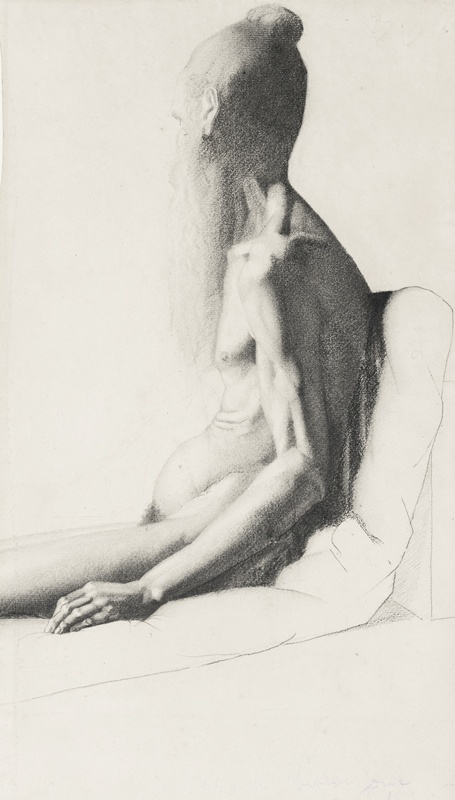 In the drawing, the subject, an old man, sits with his face turned away from the viewer, shoulders slumped, with folds of skin rippling down his stomach. Delicate effects of light and shadow are achieved through soft, rubbed, and repeated strokes and cross-hatching. The addition of Mendiant Hindou gives them an important capsule collection. and I hope will inspire them to display all four of the works together so visitors can see the progression of his work. This entry was posted on Sunday, February 9th, 2014 at 11:58 PM	and is filed under Modern(ish), Museums. You can follow any responses to this entry through the RSS 2.0 feed. You can skip to the end and leave a response. Pinging is currently not allowed. Seurat’s drawings are so beautiful! (But $4million – really?) Thanks for bringing them to the attention of your history lovers. Glad you survived the Richard III fest and didn’t spontaneously combust from the excitement. Cheers! The Getty has a bottomless well of funding so whatever it’s worth to them is what it’ll be worth on the market. Someone else must have really wanted it, though, or the bidding wouldn’t have reached the stratosphere like that. Richard III fest was a little frustrating due to streaming issues, so I’m keeping the pure excitement in reserve for when I can watch the whole video. Mendiant Hindou took my breath away. Such delicate rendering. It is impressive that finally drawings and other works on paper are finally being recognized as valuable as other works in the upper echelons of art collecting. Hooray. I am wondering if you could post the dimensions of art pieces, as that often affects how one perceives the art itself. Seurat obviously is using the texture of the paper as part of his technique. From the apparent courseness of the paper, I am assuming that these pieces are on the small side, but would like to know for sure. I’ve thought about including dimensions before, but I usually pass just because I already tend to write overly sentences even without additional parentheticals. Usually the links will have additional information like dimensions. For the art works in this post, Helmeted Warrior is 25 1/2 ” x 18 11/16″, Mendiant Hindou is 19 1/4″ x 11 1/4″, Madame Suerat is 12″ x 9 3/16″, Woman Strolling is 12 1/2″ x 9 7/16″, Poplars is 9 9/16″ x 12 3/16″ and La Grande Jatte is a whopping 6’10 “x 10’1”. Cash is apparently free these days. My favourite on here is that dark and almost spooky portrait of the artist’s mother, as the piece will probably be ‘modern’ for yet another century. When it comes to ‘size’, there seems to be a painting with people directly in front of his own ‘La Grande Jatte’ indicating that at least ‘la Grande Jatte’ is really huge. Oh yes, it’s monumental piece, approximately 6 by 10 feet. I love the portrait of his mother as well. The way he uses the texture of the paper and density of crayon to create her features is otherworldly. 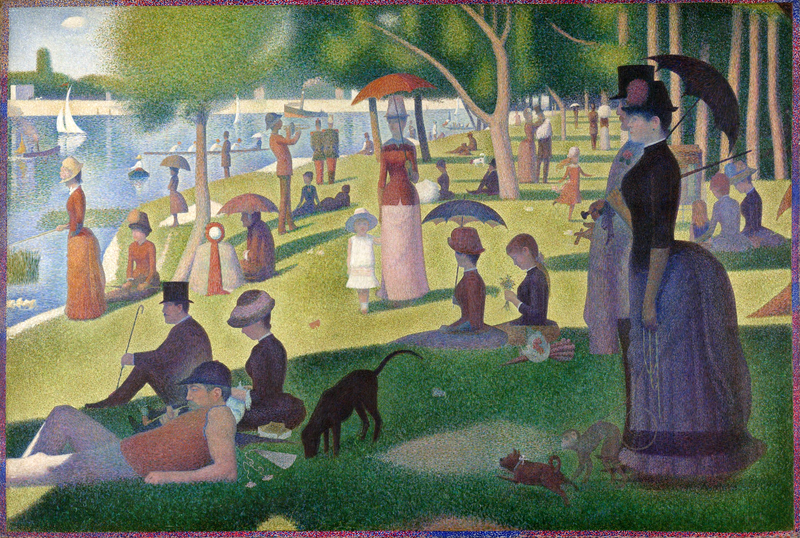 I never cared for “La Grande Jatte”, it seemed kind of garish and cartoon-like. But his drawings show such humanity; the old man whose face is turned away (I believe) to respect his dignity, the womans face on the left of the 3 drawings – only someone amazing could capture such a feeling of weariness and fatalism with a few strokes of a pencil. To me, it resembles a death mask simply awaiting death. Thank you for giving me a chance to realize he did better work than that one painting. You’re very welcome. Thank you for giving Seurat a chance despite his overwhelming identification with his one most famous piece. I have seen La Grande Jatte, and it is quite large. La Grande Jatte was apparently painted from smaller units that don’t quite match in perspective, shadowing, etc. Nobody knows quite why: perhaps an experiment in time or simply an artifact of the way the painting was worked out. I am not fond of it myself, though the color work fascinates me (Seurat uses a different approach to color theory than most artists). But I am finding these later drawings both lovely and challenging & would like to have more detail about them. Alas, a search found nothing. It is easy to look up well-known paintings for additional info, but not so new finds and often more obscure works. You can read a little more about the Getty’s three other drawings in the link above the blockquote, but Rebecca is right that the best source replete with detail about Seurat’s process from paper-making to the Conte’ crayons he favored is that online MoMA exhibit. The sketchbook highlights are just one aspect of it. MoMA’s store still has the stunning catalog in stock, & my public library has a copy, so yours might as well. Good luck! OMG you are so busted! I linked to the MoMA online exhibit in the first paragraph. Your first comment was held in moderation because it contained a link. I have it set that way to catch spammers that sneak past the filter, as a surprising number of them do. It’s up now. For some reason Flash does not work properly on my machine. Very irritating. Suggestions welcomed, but chances are it’s already been tried. This seems to be a common issue. Arggh, caught skimming! Sorry, Livius. Usually I pay 110% attention to every word, phrase & clause you write. But it’s a good enough site to get mentioned twice. I love that MoMA creates those things & then leaves them up, forever.